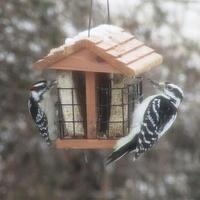 The Center participates in the winter bird feeder counts sponsored through Cornell University Lab of Ornithology. Volunteers observe, identify birds, and record data at the McConnell Hall bird feeders. You may visit on any of the count dates, arrive and depart at any time. If you need training to participate please contact the Center.